Got a 10 miler in tonight. Still quite warm. After giving the legs a good bashing last night I decided to attempt every mile at around 7m/m pace. Managed to do it. Had to work up a long incline at 8 miles to hit the split as last night's session kicked in. Matters also not helped by eating a whole tin of beans on toast 2 hours before. Guts grumbled big time but made it home in time. Schoolboy error. Stats showed average at 7.00 pace with splits just a couple of seconds either side. Happy with that. Dry today for the run in and just under 10m/miles for the 4m. That's a good effort G Dawg.Those mid week 10 milers near Mara pace are key for Mara training. Hang in there Poacher. Good miles on the bike. Hopefully the running will come back soon. Unthinkable BB but somehow you seem to cope and benefit from the massive workload. I had a humble 5 last night. Minute on minute off ×16 club sesh. It hurt. Still looking good for 60 this week. No racing but parkrun number 245 tomorrow. OO - Rother Valley is just south of Sheffield. Tough session. Enjoy parkrun. DT19 - very tidy MP run. Stevie - yes, you certainly seem to have made rapid progress. Poacher - good miles on the bike - hope your foot improves soon. I'm sure we have enough local contacts here to twin with somewhere in Lithuania. Badbark - I doubt I could average that kind of pace for 6 x 1M even on a low-moderate mileage week, let alone in a high mileage triple double week! Incredible stuff. GD - excellent 10 miler. Leslie - just think how easy it will seem when you ditch the backpack. 6 mile recovery run this morning @ 8:24/m. First run with a new watch (old one is broken). Just one of the very basic Garmin models. Interestingly it measured my average bpm as 115. OO-I find that booze leaves me with higher hr the next day. I followed up my lunch session with 5 at recovery last night for a 14 mile day. I must say, splitting it up like that is much easier. I didn't really feel like i'd run last night. Planning a 15 mile mlr tonight. Forecast says it'll be 13c at 6pm. It's a bit sad but also indicative of the what too much warm weather does to a runner, I am SO looking forward to running 20 miles in a "Baltic" 12 degrees tomorrow. Interesting booze news today. We're all drinking too much. Would be nice if they would caveat these claims that such studies do not apply to marathon runners. DT19 I used to do a lot of double days when I was working and was equally surprised at feeling ok on the 2nd run. It’s a good alternative when you don’t get time for the mid week long run in 1 hit. GDawg as long as I don’t go above 3-4 pints I seem to get away with it but as DT19 says the HR seems to go up significantly. 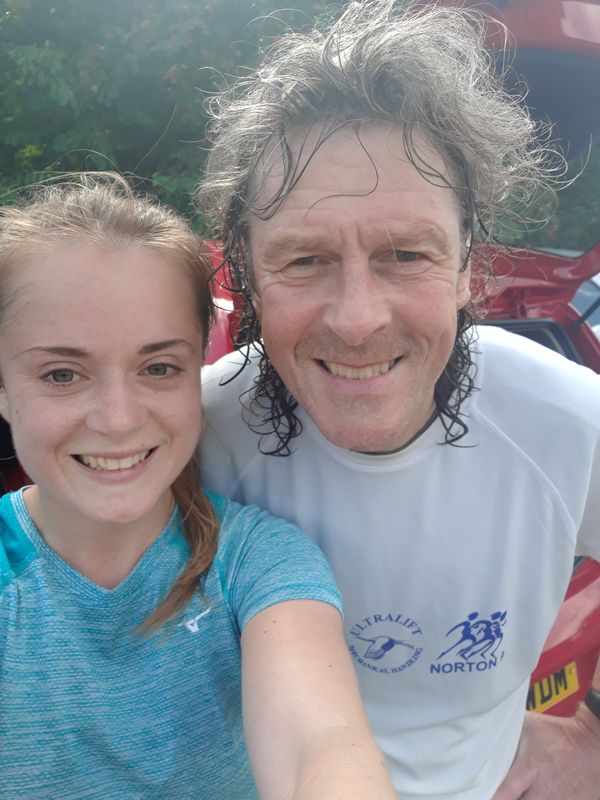 coincidentally, Gul - loops at Rother Valley this morn (it is flat there, OO ) - 11 miles for me, with a 3 mile tempo segment, whilst my daughter bagged 13 with 8 mile segment at approx HMP. She took a "beauty and the beast" selfie afterwards . . .
Gul -That 17 miler is indicative of your current form. It's quality, well done. What I am curious to know is.... did you intend to do that, was it an acid test for a potential sub 3 shot? I recall a certain Mr Phillip Jones used to run 20 miles at MP before his marathons to prepare himself mentally for the challenge. Is your new watch a wrist HRM? Poacher - That must have been a cool job. I can't say that I'm a big Robbie Savage fan. On the subject of doubles, I love them but have given them up (for now) as I'm giving myself much more recovery time this campaign, so basically the opposite of Badbark. Had a bit of a shocker yesterday. 18:55 for about 7th place, looks ok on paper but the course is a bit short. It was horrible weather, F5-6 wind and rain. I was hoping to be considerably quicker based on last week's parkrun but as expected I don't usually perform that well on a lunch race. I am having a really light week here as I have my son all week and for the bank holiday but I'll get back to it next week. 4.5 miles on lunch along the prom, windy again but dry. Hang in there Gerard and please sort out that weather before October! Incredible mileage again Badbark, is it one more big week and then a 2 week taper? Great 10 G-Dawg looking in good nick. Good luck at parkrun tomorrow OO. Another 10 mile tempo this afternoon in the wind and rain. Went for consistency rather than progression and yielded my best ever performance. Slowest mile of 6.33 and fastest of 6.25 (last two) Average of 6.29 and really felt like I could keep going at that. Rest day tomorrow and then an easy 16 on Sunday morning up and down the canal. Stevie, another impressive tempo. your progress is remarkable. you must be looking at Cheltenham with another 5 weeks training to come and be thinking sub 82? A ridiculously east 12 mlr last night. Average pace 8.08mm but my hr average was 132. practically effort less and bottom end recovery hr. I actually felt cold at times. spin class which I was able to hit hard due to the ease of last night's run followed by 2.5 on treadmill to take me to 40 for year and so set me up for a 60. Off to the footy this afternoon for my son's first match. it's an fa cup preliminary game but very big local derby for our home town v neighbouring town. We are very well supported for the level, getting 910 on Tuesday night for a league game. Anticipating about 1500 going today so a decent crowd. Hope the football goes well, DT. He must play a decent standard to be in that comp? Must also be a youngster in an adult side? Good luck to him. 20 mile LSR at 8.06 pace this morning. Cooler temps were very welcome and early on I really had to make a conscious effort to keep the pace easy. It's a lumpy route and eventually the quality sessions I did in the week started to show in my legs. I trashed them good and proper. I guess a large part of training is hammering the legs and forcing adaptation, well I certainly did that this week. Fortunately I have some experience and know to avoid over-training. A 4 mile recovery tomorrow will take me to 47 for the week. sorry, to clarify he's only 8. I meant I'm taking him to watch his first footy match. Nice to get the 20 out of the way. I was going to say!! You clearly are too young to have an adult footballer! Great that you're taking him to his local side. Off to Woking v Truro in a minute. Leslie – I like your slow recovery run pace. That’s a proper recovery. Gul – Good recovery run, with a low HR. I’ve had to wear my Garmin Fenix in the inside of my wrist to get an accurate HR measurement. OO – That’s an impressively high HR for that pace! I agree about doubles. Despite being a morning person, I always enjoy the shorter 2nd runs. Birch – Lovely pic, ye beast. Good running from you both too. GM – That’s still a good run in bad weather, it can make such a difference. Stevie – I’m doing a 3 week taper but won’t be tapering the intensity until the last week. I’ve a marathon on Wednesday which I’ll run about MP+10%. DT – Good MLR done. Would you ever consider doing your MLR’s P&D style? Which is about half at MP+20% and the other half at MP+10%? It’s a good marathon training run, especially after an interval session when you’re a little fatigued. GD – Good leg hammering week – I agree entirely – I’m living proof of forcing adaptation to improve. I ran 24 miles today including my local Parkrun after 15 miles. I was feeling good so put in about 95% effort and I’m very happy to have run 18:21, which is my fastest Parkrun since 2015. It was also the first time I went over 79% WAVA in a Parkrun. I averaged 7:14 m/m pace for the 24 miles with HR ave only 132. I’ve now run 104 miles this week with a 10k race tomorrow. Due to the bad weather forecast for tomorrow, I ran a bit quicker today than originally planned, so will run the 10k at about HMP effort. I might even enjoy a wee drink tomorrow night as it’s a bank holiday Monday and my taper begins! Blimey Badbark impressive parkrun after all those miles. I managed 18:09 but felt comfortable and last mile was 5:43- wava 84%. 18 tomorrow would get me to 70 but I may fall short. Birch - Great photo. How's your boy getting on? OO - I know, it's been a shocker the past few weeks. If it's pouring down and blowing a gale on marathon day I might just stay in bed! Great park running again! Stevie - You're flying, long may it continue and you defo have the speed to go for a sub 3. DT - I hope you enjoyed the match with your son. Which team do you support? G-Dawg - Good miles banked. None of my long runs will be fast this time round. I'm not aiming for a fast time, so I just want to get them done. You do plenty of fast stuff so you'll be grand. Badbark - That race series looks great and as you say, OO would be quids in. Great training and park running sir. You're looking great for Berlin. The Jersey marathon is a great race for fast women to cash in. In recent years they have brought over some Sub elite African women who have run 2:4x but it is usually won in 2:5x or closer to 3hrs and the last time I ran it in 2015 a lady who was visiting from Norwich came 3rd, she ran 3:25, she won £500! That was her weekend paid for and some. Zero here today but might get a run in tomorrow if I am lucky. Rain and wind forecast for tomorrow, not ideal! GM - good 5k effort in those conditions. Yes, new watch is wrist HRM, so I guess it won't be as accurate as my chest strap, but then again I'm sure that used to throw quite a few wobblies. And no, I hadn't intended that run to be more or less all at that pace, probably the time restriction subconsciously made me push a bit harder. Hope the weather holds up today for you. Stevie - that's a cracking tempo run - no stopping you at the moment. DT19 - that's a great MLR with such a low HR. Hope the local derby turned out to be a great match for your son's first. GD - solid 20 miler. Badbark - those are quote astonishing stats for you long run inc. parkrun. You should be very confident starting your taper. Thanks for the HRM tip - might try that. OO - great parkrun for a stonking WAVA. Rest yesterday (set off at 3am for Heathrow), and 10 easy miles this morning to make 64 for the week and complete the P&D endurance phase. Gerard - well toughed out 5K (ish) there , what with the weather etc . . my son's doing a "Podium 5K" (these are to encourage fast times, apparently), over in Red Rose territory (Barrowford) tomorrow - he's hoping to go sub 16, thanks. Hope you are enjoying the break with your lad - anything planned tomorrow? 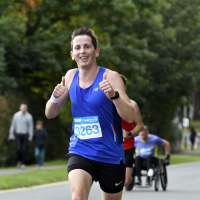 Stevie - ditto with the conditions for your 10 mile tempo - these are tough sessions - even when feeling good, as you did, there is still the discipline of keeping the concentration and not inadvertently letting the pace slip. Very encouraging. GDawg - good 20, well judged . . .
DT - hope your boy enjoyed the football. Trying to remember your location - was it the Alvechurch v Bromsgrove clash ? You'll not notice the incline, Gul - well, maybe on the last couple of laps Do you know the course? I was assuming its repeats of the lap I use (3 miles), but I'm not sure whether there are extensions to this. 4 very weary miles yesterday (vogit legs very heavy after Friday's effort) - will venture out later for a few - the forecast rain has arrived, so will be a soggy outing. Great parkrunning and immense was, oo! Equally impressive all round, Badbark. hope the 10k went well. I tend generally to run general mileage as easy as possible particularly as I'm currently running my highest ever mileage. 64 for most would still be a very good week, Gul. Birch, yes Alvechurch v Bromsgrove. Best of luck to your son. G-dawg, I must prefer the experience of non league footy. The players are normal blokes, no major security operation, fans from both sides interacting etc. I was worried he would get bored but that concern was alleviated with it being 2-2 after 17 minutes. Game ended 4-3 to Alvechurch who are in southern prem which is a league above us. I was due to run 20 this morning for a 60 mile week. However given weather I postponed until tomorrow. I decided to do my 8 mile hilly loop (538 feet of gain) but with a bit of welly. Came in 7.29 average for a very low 143 hr. Looking back in Strava I've done this route about 10 times but very rarely sub 8mm. I have a couple of efforts in November and December where I ran it about 7.55 pace and my hr for those was 143 also. Seems like progress! 20 in morning. Leaves me with 48 for week. Nice running DT and glad the football was exciting. Woking came back from a goal down to win 3-1, we're now top of the Vanarama National South. 4 recovery miles today in perfect rain. It was glorious, such a nice contrast to the last couple of months.. 7.30 pace with a mix of paces to shake the legs out and prepare them for the week ahead. 47 for the week and plan to do just 40 next week. g-dawg, I see you are newly relegated. you must then be well placed to challenge for promotion then. Bromsgrove have just had two successive promotions and are currently top of league after 2 games. the club is only in 8th season having replaced the previous entity who went bust after about 100 years. I think we have realistic ambitions of national north and have a ground fit for national league. We had over 3000 in the ground for an fa vase semi final 2 seasons ago. stopped raining now, could have saved myself and run this pm. GM – That’s nice money a women can win in Jersey. I hope you got out in the rain today. I finished off my 4 week block of high mileage training with another 13 miles today. This included ‘Storming the Castle’ 10k which I completed in 37:31. I hadn’t planned on running quite that fast after yesterday’s 24 miles but felt in control, with an average HR of only 149. I had a bit more in the tank despite only being 45 seconds outside of a PB. So that’s now over 117 miles this week, bringing up over 440 in the last 4 weeks. Needless to say this is the most I’ve ever run and intend to ever run! Most importantly of all, I feel strong and without a single niggle. Three weeks today I’ll be running a marathon PB in Berlin. I’m now going to enjoy some cheesecake drowned in Baileys. I'm loving perfect rain G Dawg! I settled for 16 and a 68 week. Birch - Sub 16 would be fab! Hope he does it. Nothing major planned, depends on the weather but it's just nice to be off and spending time together. DT - Good signs on that run based on previous attempts. Badbark - Great 10k. Looking good for a fast outing in Berlin. G-Dawg - A nice way to close out the week. I didn't bother with running today. Another day's rest won't do me any harm.This coming week should see me back to it though and I'm off work so will probably do a LSR Tuesday and then another towards the end of the week. Birch - good luck to your son in the 5k; but sounds like he's talented enough not to need luck! The marathon course is just short of 9 laps round the main lake; I guess that's the same as the route you took. DT19 - good hilly effort. Hope the weather is better for your long run today. GD - nice easy run to finish a good week. Badbark - another cracking run to finish a storming 4 weeks. You've certainly earned that cheesecake. OO - great weekly mileage. GM - enjoy your week off and double LSR! Realised it was Bank Holiday today, so rearranged my schedule to do the 15 mile MLR this morning. (LT run now pencilled in for Weds). 8 mile @ 7:41/m and 7 miles @ 7:04 /m). Not having a smartphone meant I couldn't get any detailed info from my last watch, but with the garmin I can upload it via a laptop or PC. Avg HR for today's run was 155 but will be interesting to see it in more detail.